Bruce Lee (Bio Med) is a YIP award winner through the Office of Naval Research and, following their news release and CHIPS magazine story, a number of news outlets and science blogs picked up the story. The media include: NavalToday.com, Maritime Executive, Ocean News and Technology, phys.org, Seapower Magazine, defense-aerospace.com, Deccan Chronicle, World of Chemicals, ScienMag and Business Standard. The Office of Naval Research (ONR) Young Investigator Program (YIP) seeks to identify and support academic scientists and engineers who are in their first or second full-time tenure-track or tenure-track-equivalent academic appointment and who show exceptional promise for doing creative research. The program’s objectives are to attract outstanding faculty members of Institutions of Higher Education to the Department of Navy’s research program, to support their research, and to encourage their teaching and research careers. ARLINGTON, Va. — Even the strongest glues collapse when soaked. Just watch a band-aid slide ungracefully off a finger or toe while in the shower. However, with support from the Office of Naval Research (ONR), one researcher has developed a nature-inspired adhesive that stays sticky when wet. 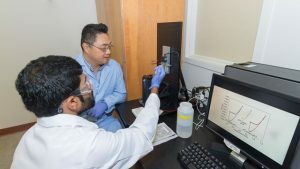 Dr. Bruce Lee, an assistant professor of biomedical engineering at Michigan Technological University, is using a protein produced by mussels to create a reversible synthetic glue that not only can bond securely underwater — but also may be turned on and off with electricity. Read more at CHIPS, by Warren Duffie Jr., Office of Naval Research. Photo courtesy of Dr. Bruce Lee.